At the Ramat Negev Agro-Research Center, acacia trees bloom, casting long shadows by the greenhouses, and fat pumpkins ripen on the ground. Everywhere you look, jewel-like cherry tomatoes dangle above the sand, on vines strung to wires, carefully irrigated and nourished. While tiny tomatoes have been around for centuries, certain varieties of cherry tomatoes – including the popular tomaccio – were developed in Israel back in the 1970s. Here they grow in abundance, as do sweet peppers of all colors – yellow, green, red, chocolaty-brown, and purple. The Ramat Negev Regional Council oversees this center, and agricultural experiments are conducted by onsite researchers as well as by scientists from Ben-Gurion University, the agriculture faculty of the Hebrew University, the Volcani Center, and elsewhere, in consultation with the Israeli Extension Service. It is a hotbed of innovation and discovery. “People come here from all over the world to study how we grow things in the desert and how to fight against the desert’s continuing conquest of their land,” Gadi Grinblat explains. It was here that scientists determined the importance, when irrigating with brackish water, of directing the water underneath the plant, so that it goes directly to the roots and doesn’t touch the upper parts. Otherwise, the salt in the water will harm the plants’ sensitive green leaves. 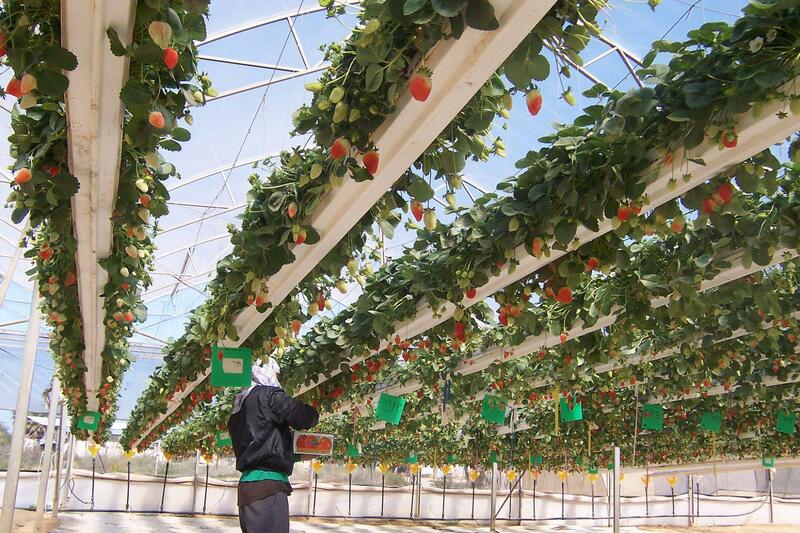 Like most Israeli agricultural endeavors, the Agro-Research Center makes use of the drip-irrigation system, which was developed by the country’s Netafim company – the headquarters of which are also located in the Negev, at Kibbutz Hatzerim. Like the Blaustein Institutes for Desert Research, the Ramat Negev Agro-Research Center is happy to spread the word about its findings with the rest of the world. Israel’s MASHAV (Agency for International Development Cooperation) helps to make that happen through its agricultural/outreach arm, CINADCO (Center for International Agricultural Development Cooperation), and with the scientific research capabilities of the Volcani Center. Israeli agro-scientists are regularly sent out to demonstrate their findings, in Africa, Asia, Latin America, Central Europe, and the Middle East – and farmers and scientists from abroad are brought into Israel to study and share their knowledge as well. Not surprisingly, the focus is on Israel’s areas of expertise: growing food in semi-arid and arid zones, combating “desertification,” irrigation and water management, dairy farming, and strategies for the small farmer. The goals are vast and vital: to ensure food security and economic self-sufficiency. Lin Arison & Diana C. Stoll are the creators of The Desert and the Cities Sing: Discovering Today’s Israel, a treasure box that highlights Israel’s creative achievement and innovation.